One of the pages I most enjoy scrapping each year is my wrap up of accomplishments for the current year and plans for the new year including my goals and objectives. This year I did not list out accomplishments of 2017. The year was filled with caregiving. It was also a very sad time as we lost my father in late summer. Just as I was getting most of the estate processing finished, a tornado came through our area. This is highly unusual for the foothills of western NC. The mountains usually stop a storm. This one managed to travel 23 miles and was 3/4 of a mile wide. Most of the damage was from downed trees. It went right down my Mother's road and did quite a bit of damage around her home. So we were very busy and my husband still is getting everything back to normal. So, it was a painful year to reflect upon and everything I did revolved around a few major events. I decided not to scrap the accomplishments and just look forward to 2018. I would though like to take a moment to pat myself on the back for a couple of things. I kept my New Year's Resolution. A resolution is promising yourself to change a habit - drop a bad habit or form a new one. I resolved to write in my journal every day. This is my regular journal which I type rather than write. I can type a lot faster and it doesn't bother my hands. And I did it! I wrote every single day of 2017. There were a couple of times where I had to write out my journaling as I'd already shut the computer down but every day got something even if it was 2 sentences. Usually it was a few paragraphs. I imagine when I look back at the journal years from now, I'll think "why did I write about all this mundane stuff?" or "boy, did I complain a lot back then," The journal was a good place to work out feelings and as well as capture memories. I also completed the 5 year journal which I talked about on my last blog post and layout. I'm not going to make a new resolution for 2018 as I have a big goal I'm working on which I'll get to in a minute. I want to continue to do my daily journaling. I would like to improve my journaling and my outlook in that I look for something positive to write about each day. Often there were positive happy comments in my journal but certainly not every day. Even on the darkest day, I think you can find something positive, some way to be grateful. One other thing I accomplished in 2017 was to finally lose a few extra pounds I've been carrying around the last few years. That was on my objectives list more than a few times. I lost a little more than planned due to stress and am at what I weighed in the 1990's. I feel so much better. My clothes fit better which was my main purpose. (You know you truly hate to shop if I'd rather lose weight than buy new clothes :-) I used Weight Watcher's old Points Plus system and it was just the right amount of structure for my lifestyle. Now to the goal and objectives for 2018. Perhaps it was losing my dad who I take after more than my mother or perhaps it is just my age, but I've been thinking a lot about what I will do when I'm older. I chose not to have children - a choice that was perfect for me. I am an only so I have no nieces or nephews either. I have plenty of cousins and we get along but we aren't super close. Plus I'd really like to move to another location at some point and probably won't be around my family. I hope my husband and I have decades more together. He is older so I have to face the fact that I might have some years alone. Now we never know of course. He might outlive me. Heck, Mother might outlive me. She's stronger than I am! And that is another thing that has spurred my desire to make some changes in the new year. I want to do what I can to have healthy older years so I can enjoy life, being active. With that in mind, I came across some information recently on the anti-inflammatory diet. The one I was reading was cutting out sugar, gluten, dairy, red meat, alcohol and happiness- just kidding about the last one, sort of kidding. I mean giving up bread and sweets? Now this might be the best thing for me, for all many of us yet while I want a healthy old age, I want to do some living now. So while the idea of reducing inflammation and thus medication I take for inflammation holds great appeal to me, enjoying food is also important. I think I can find a balance. As far as I know my health is good but I know it can be better. I know that the things that cause heart disease, likely cancer and dementia are building up in our bodies for years. Most of us need to move more and eat less - or at least less of certain foods. I want to do what I can to prevent problems and still enjoy a full life. The fact that my mother can lift more than I can is a bit embarrassing. She's a gardener and truly loves nothing more than raking leaves, moving rocks around in her flower beds and keeping every inch of her yard pristine. I do not. She cares about making her house look perfect inside and out. I do not. So she is strong and I, I'm ashamed to admit, am not as strong as I should be. Yet remember that bit about balance. I doubt very much that at the end of 2018 my yard will look as pretty as hers but I hope it will look better. Mostly I just hope that I am a physically stronger person. I've come up with a list of things I can do each day to fill my stomach with healthier foods and hopefully then less of the unhealthy ones. The list contains activities that will get me moving more. I don't expect to do everything on the list every day, certainly not at first, but it is a goal to work toward. In a few months, I hope to be not only stronger but have a little cleaner and more organized house and maybe even make a dent in the yard work as these chores are good places to get that increased activity. Dh and I already walk whenever we can get decent weather. Now I'm still a caregiver and of course I could have other issues that interfered with my plans. I followed Weight Watchers though through some of the most hectic months of the year so I hope I can do this. It might take 30 years to find out if it helped me but I hope I'll get a reasonably clean house and some new menu options in the short term. Awesome layout! I like the focus on the things you're going to do instead of what you'll do less. It's crazy that your Thickers did that. I have some aqua foam stickers that are the same way. I wonder what causes it. Another great page, Lisa! Happy new year! That is such a great page Lisa. I love that you are so positive and instead of dwelling on what an awful year 2017 was for you, you are looking forward! That is so annoying about the Thickers - usually I have the opposite problem where they lose their sticky-ness altogether! Congrats on the weight loss - you look amazing!! 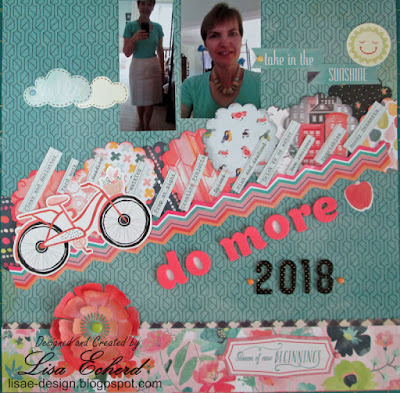 I really like the way you used the brads - and great tip to use washi on the back!